September 8, 2018 is Norwood Day! Before moving here, I had no idea Norwood Day even existed. However, they expect some tens of thousands of people to attend! 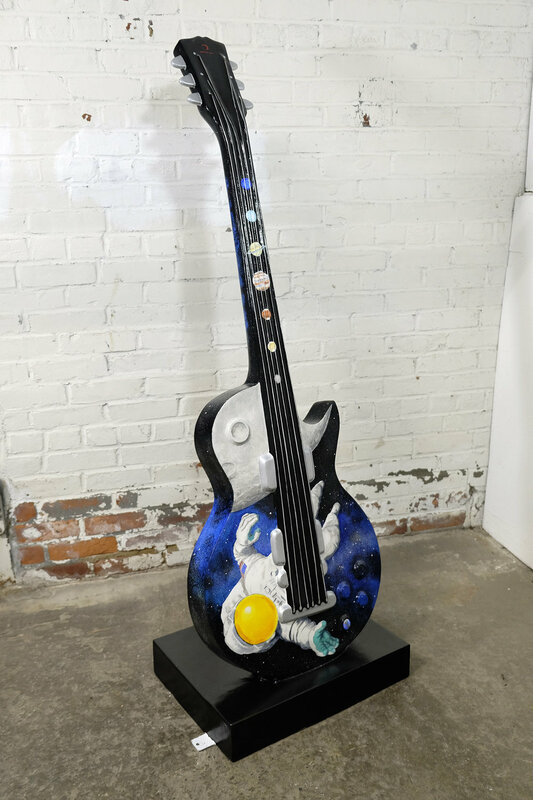 All of the Music Drives Us hand-painted guitar sculptures will be on display on Norwood Common, including the one I created. The other artists and I have been getting quite a bit of local coverage — including local cable news, Wicked Local, and The Norwood Record (see page 2). After this event, the guitars will be displayed at various businesses and public locations in Norwood before being auctioned off in mid-November to benefit Music Drives Us. If you're in town, come on down! Last Spring, a stylishly dressed group of folks were visiting the Norwood Space Center and came through my studio. One of them introduced himself as Ernie, and we briefly chatted about the project I was currently working on. It was only later that I learned that this was Ernie Boch Jr., whose family were instrumental in creating the "Auto Mile" — a car-shopper's paradise here on Route 1 in Norwood. A few days later I was contacted through The Space Center that Mr. Boch liked my work (especially the astronauts) and wanted to make sure I was included in the applications for a new branch of his Music Drives Us program called GuitARTS. GuitARTS is a public art project facilitated by Cowpainters. If you've ever seen a hand-painted fiberglass cow, or lobster, or other hand-painted public fiberglass art, chances are good these folks fabricated the original form. For the GuitARTS project, ten electric and five acoustic guitar forms were created. These were to be hand-painted and displayed in Norwood, then will later be auctioned off to raise proceeds to fund music education throughout New England. 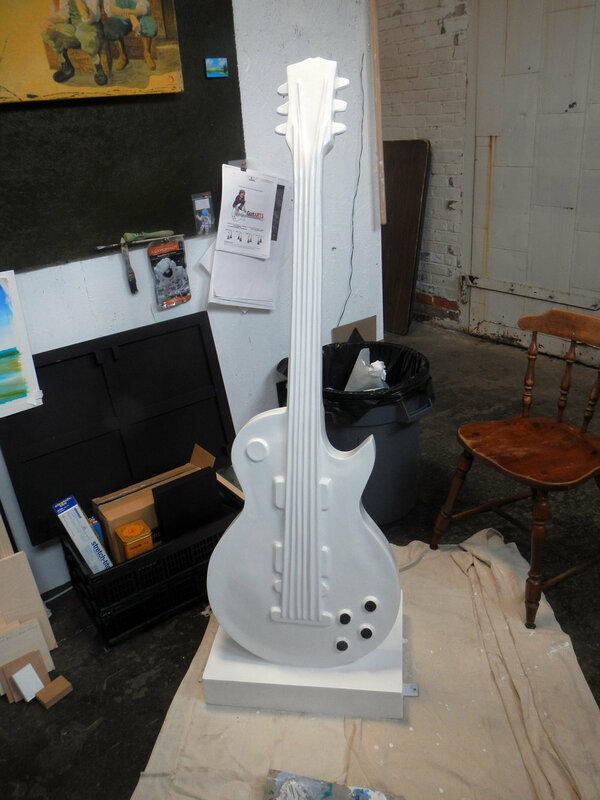 I submitted a design which was accepted, and a few weeks later a giant five-foot fiberglass guitar was delivered to my studio by two well-dressed young ladies clicking down the hall in their high-heel shoes. It was a sight to behold. It was also sobering to see the object in real life and face the challenge of decorating it. I felt like I was suddenly working as a carousel painter, sizing up a freshly-carved horse. Firstly, the knobs had cavities in the middle and that didn't work for the idea I had in mind. So, I filled them with epoxy. After 24 hours of curing the sculpture was ready to be primed for oil paint. After double-checking the measurements, I enlarged my design and had it printed at life-size. I used two chairs to support the form and used the print as a transfer to start sketching in the art. Once penciled in, I began painting. Indanthrone Blue was used as an undercoat for the Milky Way portion of the sky. 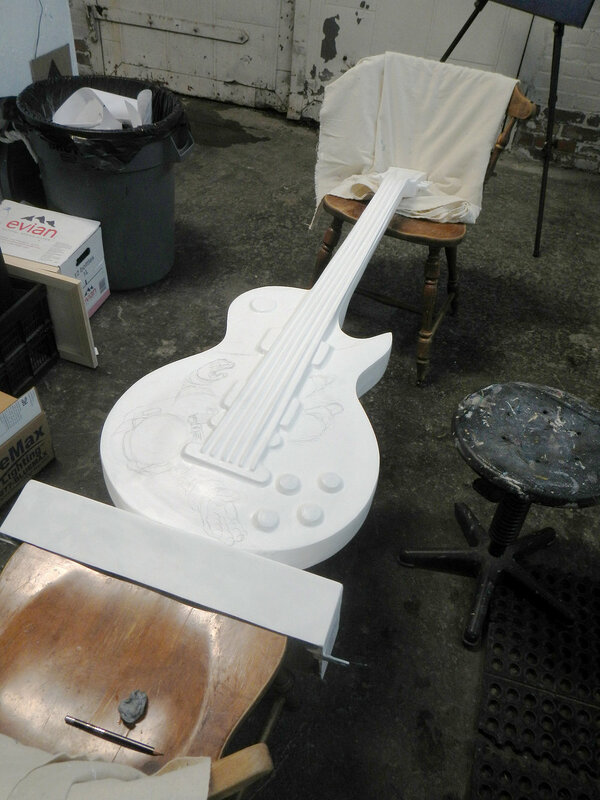 While the front was drying, I was able to flip the guitar over to start painting the back. More Indanthrone Blue and a coat of Ultramarine Blue for the Earth. Seven of the planets were then painted up the neck. I started wrapping the design around the sides. I finished off the basic Earth on the back. After two more coats of blue for the Milky Way, I started to paint in the blackness of space. Here's the back after adding black. I edged in the planets on the neck and painted in the black. I took advantage of the form of the sculpture by using a linoleum print ink brayer to roll on the strings in silver. Finally, the Earth was painted in on the front and details finalized. Rose inspecting the final product. Awaiting pick-up for a final automotive clear-coat. The guitars will be displayed publicly starting in September, then auctioned off November 15th at Ferrari of New England in Norwood to benefit Music Drives Us. I will post the location of my guitar as soon as I know where it is to be displayed.